The team of 36 volunteers from England, Sweden and Ireland returned from another successful trip on Sunday 27th August after two weeks travelling to/from Moldova and creating bathrooms in a school in the village of Struzeni for the children. The school is in poor condition but the charity (through monies raised by volunteers) paid for new windows, new doorways and plastering of the room and corridor prior to arrival, as a good basis to then start the bathroom creation. The charity would like to thank Romeo, a long standing supporter in Moldova of TEECH, for the coordination of the works prior to our arrival. In just 8 days on site internal walls were erected to split one room into two, which became one bathroom for the boys and one for the girls. In the boys a urinal was installed, two toilets and three hand basins. In the girls five toilets, four wash basins and three hand driers, along with new lighting in the corridor and rooms. Painting was also done in the rooms, corridors and murals around the school, along with lino on the floors which makes a huge difference to hygiene (previously just concrete floors). By luck a local man called Vasea wanted to volunteer after the charity supplied him with a bike to help with his work. He was an excellent carpenter and tackled the door architraves and all the skirting in the new rooms working with the team for a couple of days to get the tasks done. A new boiler for hot water was also installed and all the waste pipes connected to a septic tank outside. The boiler provided, for the first time, hot running water in the school. The septic tank was installed in 35+ degree heat, really pushing the team to the limit. A local digger was used to dig out the hole but it was placed into the hole, levelled and back filled by hand. 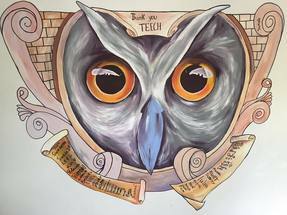 We were also joined by three US Peace Corps volunteers and 4 young teenage Moldovans who were volunteering their time once again with TEECH supporting the team with translation and some excellent art skills (an example of Sergiu art is shown at the top of this page). Ivancea – the 2016 location for the toilet project – visiting three homes to provide a disabled gentlemen with a bed and wheelchair, another family with a wheelchair and family with a young baby, with no income, with a pram and baby clothing. Ghetlova older persons home with incontinence pads and home visits in the village to deliver food parcels. Balti psychiatric hospital with wheelchairs. After seeing the condition of the hospital volunteers had a whip round and raised over £300 which will be used to supply the hospital with shampoo, shower gel, toothpaste etc for the patients as conditions are so poor. Rehabilitation centre for men with drug and alcohol dependencies to provide them with clothing and food. Thanks also goes to Trade Aid for donating kit for an electrician, carpenter and plumber. Those with trade skills in the village were identified by the Mayor and the tools provided to those individuals but on the condition they would carry out work at the school if required. Thank you to all of you, who donated clothing, food, medical aids and much much more, making this all possible.